Having spent weeks researching photographers we were beginning to think we wouldn't ever find the right fit for our wedding, but we were oh so wrong! We first met Peter at a small tea room in Bridge near our venue the summer before our wedding and it took us precisely 10mins after the meeting to contact him and confirm he was our man! From that point on, we were in constant contact with Peter about our developing wedding plans and far from being 'just' our wedding photographer, he became our counselor and friend. He has a knack of knowing when to check in and make sure things are ok. Peter seemed genuinely as excited as were were about our big day and, in hindsight, being able to confide all our plans to someone and get the reassurance that things would be fabulous in the end was just invaluable (especially considering we didn't have a bridal party!). He made sure we stayed focused on the big picture and not the everyday 'wedmin' details. We've never heard of a photographer making mix-tapes for his clients and sending them date night packages to make sure they take some time out for eachother as a couple! Peter's photography style completely suited our relaxed, informal farm fete style wedding. He is a self-confessed details man and captured all our personal touches perfectly. Peter blends in with wedding guests with such ease that you really do forget he is there sometimes! We didn't want big formal group shots and endless 'just one more' moments. We wanted a fun and beautiful record of our day - Peter certainly gave us that and went above and beyond to make sure that we would never forget what an awesome day we had. We have looked through our wedding photos so many times and have sent a lot of them out to our guests as a momento of what will forever be one of the best days of our lives. So many of our guests wanted to know how we had found Peter to book him themselves and lots assumed he was an old friend from our Canterbury university days! We really do feel that having Peter be our wedding photographer was one of the best decisions we made and wouldn't hesitate for a single second to recommend him to others. Oh my word, where do we possibly begin!? We knew from the very start that we loved Peter's work but we were never expecting how absolutely mind blowingly perfect our photos would be! Peter is genuinely one in a million...he put us completely at ease from the very beginning. His enthusiasm and excitement for our special day was something we can never thank him enough for. For 2 people who cringed at the thought of being in front of a camera, we felt instantly comfortable, laughing and enjoying every moment thanks to Peter's general awesomeness! He is far more than just our wedding photographer, he has become our friend! We could not have asked for a more amazing person to capture our special day. Everything we dreamt of and more. We can never thank you enough Peter! From day one I knew we had made the right decision getting in contact with Peter! He was just so enthusiastic about our wedding and his true love for his job really came through! We never felt like ‘just another one if his many clients’, we always felt like his main priority. When we met up for the pre-wedding shoot we were nervous of course, but honestly, within minutes it just felt like we were meeting up with an old friend we hadn’t seen in ages! This instantly put us at ease, which very much comes across in the pictures! He just has such a natural eye for what’s going to work regardless of the weather or setting! This meant I could breathe easy for the wedding day, knowing it was one less thing to worry about! 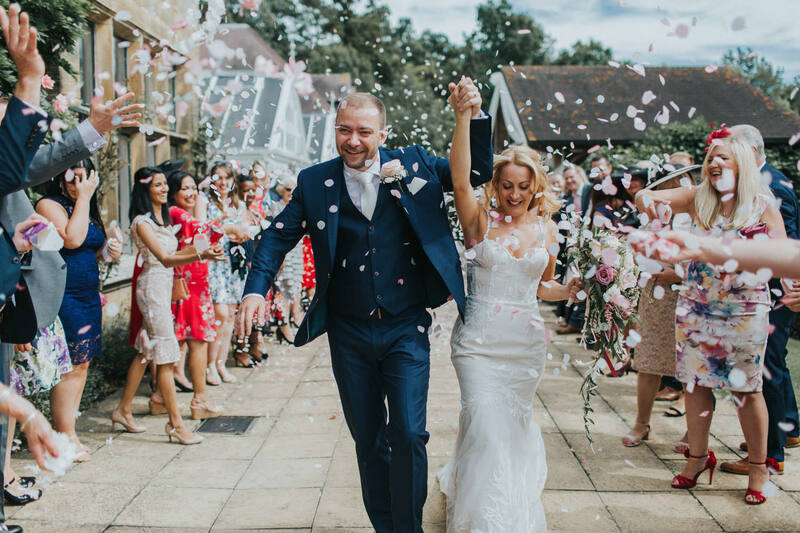 Picking a photographer to capture your special day is no easy task and can certainly seem daunting, but when we came across Peter's work we just knew that he would be the right person to have by our side. Everyone will tell you when you start on your wedding day journey that the photographer will be more than the person just taking the photos, but what you don't realise is just how true and important that point is. From the moment we met Peter at a coffee shop in London we knew we were making the right choice. Peter's enthusiasm, passion for wedding photography and down to earth attitude shone through. Planning a wedding is fun, but is also incredibly stressful at times and we cannot thank Peter enough for being by our side. He provides so much support and advice along the road - really above and beyond what you expect from a photographer. Most importantly though on the big day itself Peter was superb! Peter knows how to fit in so well and make people feel at ease whilst he captures those really important moments, those where your friends and family are just themselves and enjoying the day. Our guests even commented after that there were times that they wondered if we had a photographer there at all! As the Bride or Groom there are moments on your wedding day that you miss, mainly because it is so hard to take it all in, when we got our photos from Peter we were so happy to see that he had captured it all - I certainly didn't realise I was smiling quite so much on the day until the photos arrived :) We would not hesitate to recommend Peter to anyone, his eye for detail, colours and moments is excellent and his photos allow us to relive that best day of our lives. But most importantly Peter is a great to work with and it truly feels like we have gained a friend along the way. When choosing a photographer for our special day I don't think we could have found a more perfect match. From Peter's style in photography, to his impeccable taste and kindred spirit, we were elated when he agreed to fly all the way out to California to document our wedding. Before the day was even close, Peter was helpful in more ways than just a photographer. With advice and suggestions he helped make our dream of a day come true. Not to mention the many sweet surprises along the way to help us cope with the wedding planning stress that can tend to cloud the joy that is ahead. This was all just a small measure of what Peter had in store because the work he accomplished on the day of was unreal. Every capture was like he took it straight out of my head and made it come to life. Peter is an outstanding photographer and if you're lucky enough to have him on your special day you are in for a treat! Oh Peter! Where do we even begin?! Peter is SO much more than a wedding photographer! We HATE photos of ourselves. We don't have one photo in our house where one of us hasn't gurned like an 80 year old that have lost his/her teeth... so when Peter turned up to do our pre-wedding shoot and had us in stitches and fearless in front of the camera, it was a complete victory. (Disclaimer: a tot of rum may have also played a part). In short, he is amazing, his photos are timeless and we could not imagine recommending a photographer (and all round great guy) highly enough. After seeing photos that Peter had taken for a friends wedding a few years ago, I knew that when our day came he would be the first photographer we would contact. Throughout the whole planning process, Peter has gone above and beyond to make sure our experience was extra special. His enthusiasm and passion is infectious and it really shows in his work. From the little gifts along the way to his cheery emails every now and then just checking in with us, he really made us feel like our wedding was important to him, and not just another job. Our photos are more than perfect and we cannot thank you enough! We can relive our day over and over and each photo manages to take us right back there with all the emotions to go with it. Thank you again, you have definitely been one of the best decisions we made! Without you, I am sure our journey would not have been quite as special. We don't know where to start when telling you how brilliant Peter is! Peter is more than a photographer, he was with us through our whole wedding planning journey with hints and tips, playlists, date nights and more, making the whole process even more special to us. When behind the camera Peter made us feel completely at ease. Neither myself nor my husband are very confident when in front of the lens but Peter found what worked...for us it was making us laugh! From our pre wedding photo shoot he got some great natural shots which warmed us up and made us feel more confident for our big day. It was great having Peter with us on the day itself, a friendly relaxed presence amidst all the initial nerves! Our friends and relatives have commented on how relaxed and happy everyone looks in our photos, which we feel pays great testament to Peters amazing work in capturing the essence of the day and those magical moments. We couldn't have imagined having any other photographer with us on our wedding day, we know for sure that our amazing photos just wouldn't have been the same. We cannot recommend Peter highly enough. He is a fabulous artist, a complete professional, a great guy, and I can comfortably say, he is now our good friend, too! From the very first moment Peter helped us to feel relaxed and comfortable and the whole experience just kept getting better. My new husband and I had no idea what to expect of our wedding photographer. We have heard of photographers who are fairly detached and only involved for the wedding itself and maybe a meeting or two beforehand. We would have probably been quite content with this to be honest, given that we didn’t know any better. Peter absolutely blew our expectations out of the water. He is incredibly enthusiastic and showered my new husband and me with helpful communications throughout. Little tips and tricks that he has picked up along the way, which would subsequently help us to make our day so lovely and unique. He would drop off surprise bespoke packages for us which encouraged us to take time for ourselves in amongst the chaos of preparing for a wedding. He would send us the occasional email with a playlist of songs to listen to – again so that we could take time to switch off every now and again. Let me tell you, his emails always came at the right time! Peter met with us regularly so that we could really forge a close relationship; all with the aim to help us feel relaxed with him, so as to create the very best photos of our big day. Peter put a great deal of effort into thinking about what would suit us, in terms of style and setting for our pictures and I feel that the results speak for themselves! Having a pre-wedding shoot with Peter was such a nice touch. It became one of those defining moments of our engagement… we really feel that this was the point when we started to feel like our wedding was close. It was so exciting and fun! I know I am rambling but we just want for others to know just how good this guy is. My husband and I recently spent a couple of hours looking through all of the photographs that Peter took for us in our time working with him (pre wedding pics, and the wedding day pics), and they really are just so good! Employing Peter was easily one of the best decisions we made. From our very first meeting with Peter we knew he was the perfect person to photograph our wedding. Peter is not only one of the nicest people you could ever wish to meet, but really takes the time to understand exactly what you want from your wedding photography and is genuinely so excited and happy to be part of your day. We have enjoyed every aspect of planning our wedding photography with Peter who has made everything so easy and enjoyable from all the gifts and tips we received in the lead up to our wedding, to the pre wedding shoot which really settled our nerves about having our pictures taken. But trust us with Peter behind the camera you don't need to be nervous at all!! Every single one of Peters pictures that we received are beautiful and in the exact candid style that we wanted. We couldn't be happier, we can't recommend Peter enough!!! Where to begin?! Peter was initially recommended by a friend and we thought we better check out his photos. It was so easy contacting Peter and his enthusiasm really came through in the emails and more so in person when we met to discuss what we wanted and what we didn't want. He seemed to grasp exactly what we wanted and seemed genuinely excited at the prospect! Needless to say we booked him and the fun soon ensued. Our pre wedding shoot was done in Greenwich park and we were delighted with the outcome of the photos. Then came the wedding day and this was the first time Peter had shot at the venue but he had definitely done his research. Again we were delighted with the outcome of the photos and the non formal approach really appealed to us. Throughout the process Peter really put us at ease and the lovely little gifts he sent throughout were really thoughtful! I would like to think we have definitely made a friend in Peter rather than him being a mere photographer... To anyone thinking about booking him, don't think just do, you really won't regret it! As soon as Mark and I were engaged, and we started to plan our wedding we knew that there would only be ONE photographer that we would choose to capture our special day - this was Peter! We had seen his work over the past few years and loved how he captured the energy and emotion in his photos. We can both honestly say that Peter is one of the most kind natured and friendliest person that we have ever met. His passion for photography coupled with his energy and eagerness to help with any queries or requests, put our minds at ease throughout the wedding journey. He provided so much support and advice along the road which was really above and beyond what you would expect from a photographer. We absolutely adored our date night gift, which helped us to take our mind off everything wedding related just for one night and just relax and watch a movie. The toffee popcorn was incredible! On the wedding day itself Peter was absolutely amazing, ensuring that all elements of our day were captured. His rapor with not only the wedding party but also the guests was second to none. From the beginning we knew Peter was one of a kind. He was so thoughtful, easy to get on with, professional and made everything so much fun! Once we saw our pre wedding shoot photos his pictures were amazing too, so we were really excited to have him at our wedding to capture our special day! Our wedding shots were even more amazing! Peter really goes that extra mile to make you feel special as his attention to detail is second to none! He also relaxes you so quickly you even forget what he is doing at times! I would highly recommend him to anyone who looking for a wedding/portrait photographer as he made our day unforgettable! From the first meeting with Peter we knew we had the right photographer for our wedding. We'd loved his beautiful photos on the website, and knew his style was what we wanted. When we met Peter his friendly nature and excitement for capturing our wedding meant that there was no doubt we would book him. Throughout the year Peter was on hand for location visits, questions, advice and our pre wedding shoot. His personal touches were never expected but greatly appreciated! As a couple we are not used to photos, posing or being the centre of attention. It was a big worry for both of us, but we had nothing to fear as Peter made sure he got to know us, how to make us relax and most importantly take some great photos. The results speak for themselves; our family and friends have been delighted with Peter's pictures. We count ourselves very lucky that we were able to secure him as he was starting out as a full time photographer. In the years to come he will be sought after by many! Peter was recommended through a friend. On my initial contact with him via email, I knew he was not your average wedding photographer. He oozed passion and romance in the way he spoke about his photography and seemed genuinely excited by our wedding story. We met with Peter and discussed our journey as a couple and our plans for the big day. He seemed so professional yet bubbling with enthusiasm. We knew our wedding photos would be safe with him. The pre shoot was brilliant! As my husband and I had never been comfortable in front of a camera, he helped us to find romantic and comfortable poses to give us the best photos! By the time the big day was here, we felt at ease in front of him and his camera lens. I never thought I would feel comfortable having my photo taken, but I did around Peter. Peter made the wedding day go so smoothly and snuck around taking candid natural shots of our friends and family which we will treasure forever. He manages to combine beautiful posed shots and natural honest pictures that reflect the day perfectly. With Peter you get so much more than "just a photographer". I don't want to ruin the surprises,if you have booked him; but along the way he sends you thoughtful parcels and emails to get you prepared for the Big Day. These made me smile so much and were so unexpected. He has a fine eye for detail and everything he delivers is done with class and perfection. His "extra details" along the way make you feel so special. I am so happy we found Peter as our Wedding Photographer. He really does have an amazing talent and eye for romance! I cannot recommend him enough!! Thank you Peter for everything, we shall never forget how amazing you helped us make our wedding.